Illness and injury never fit conveniently into your schedule. 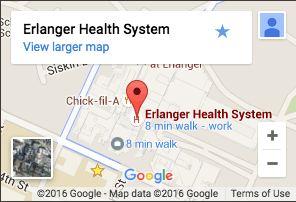 The Urgent Care Center at Erlanger Western Carolina Hospital is the place for life’s non-emergency medical needs that require timely same-day medical intervention. At the Urgent Care Center in Murphy you’ll find quality health advice and treatment with no appointment necessary. Our highly-trained, professional staff is ready to provide prompt care for medical emergencies that aren’t serious or life-threatening in nature. Come prepared to ensure your visit runs smoothly. A valid ID is required for treatment. For the insured, an insurance card is necessary. All minors must be accompanied by an adult. Payment is required at time of service upon check in. We accept cash, checks, and American Express, Visa, and MasterCard credit cards. Self-pay discounts are available.